Paul Michael Slayton (born March 11, 1981), better known by his stage name Paul Wall, is an American rapper from Houston, Texas. He is affiliated with Swishahouse Records. He has released several albums under the label and collaborating with other rappers signed to the label. He was musical partners with rapper Chamillionaire with whom he released several albums including the independently released Get Ya Mind Correct. In 2005, he was signed to Atlantic Records and became successful with his major-label debut The Peoples Champ. Get Money, Stay True followed in 2007. Wall attended Jersey Village High School and studied mass communications at the University of Houston for three years. After proposing to do promotions for Michael "5000" Watts' company, Swishahouse, Chamillionaire and Paul Wall came to Watts' studio, KBXX. Paul and Chamillionaire convinced Watts to let them rap on his radio show and put the verses on one of his mixtapes. That mixtape was titled Choppin Em Up Part 2, which was released in mid-1999. The freestyle became so popular in the streets that Chamillionaire and Paul Wall became regular staples on Houston's mixtape circuit, appeared on several of Watts' mixtapes and became permanent members of Swishahouse. After fellow member Slim Thug left the label, Chamillionaire and Paul Wall followed suit and the two started their own group known as The Color Changin' Click (named after Chamillionaire's chameleon persona). Each successive mixtape released by The Color Changin' Click led to more business opportunities; the most notable of which was a contract to do a full album for Paid in Full Records. A one album contract was then negotiated between the Color Changin' Click and Paid in Full's label head, DJ Madd Hatta from 97.9 The Box, and the CCC's first album, Get Ya Mind Correct, would go on to sell over 200,000 copies. Wall's first music exposure came as a street team member on the Northwest side of Houston, promoting southern labels like Def Jam Records, Cash Money and No Limit Records. He is also an accomplished and proficient mixtape and party DJ, known for producing mixtapes in the now well-known screwed & chopped style, which was invented by DJ Screw. Paul Wall and Chamillionaire were originally affiliated with Swishahouse Records, but left for Paid in Full Records a short time later. After several mixtape and independent releases including Get Ya Mind Correct, the two parted ways, citing creative differences. Chamillionaire continued to release independent records, while Paul Wall returned to the Swishahouse fold. This move allowed him to appear on Mike Jones' first commercially distributed single, "Still Tippin'", from his first major label album Who Is Mike Jones?. The single is originally on Swishahouse's The Day Hell Broke Loose Part 2 aka Major Without A Major Deal, released in 2003, the album went on to sell over 500,000 copies two months after being released. 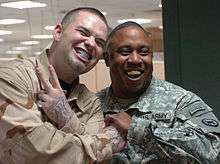 Paul Wall shows off his grills with a smiling fan in Baghdad, 2007. In 2005, Paul Wall released his first album, The Peoples Champ, which debuted at number one on the Billboard 200. The first single "Sittin' Sidewayz" featuring Big Pokey. The second single, "They Don't Know", featured Bun B of UGK, and the video version also featured Mike Jones. The third single is "Girl", receiving radio airplay and peaking at #35 on the Billboard Hot 100. In 2007, Paul Wall released his second album Get Money, Stay True, which debuted in the #1 spot on the Billboard Chart Top R&B/Hip-Hop Albums. Paul Wall released the singles "Break 'Em Off" featuring Lil Keke and "I'm Throwed" featuring and produced by Jermaine Dupri. Paul Wall was a member of the rap group Expensive Taste, with his good friends Travis Barker and Skinhead Rob (Transplants). In 2007, Paul Wall appeared alongside other celebrities and regular people in the music video for "Rockstar" by Nickelback. He also appears on reggae artist Collie Buddz self-titled debut album. Paul Wall performing in Baghdad, 2007. In the spring of 2008, Paul Wall joined Strange Music recording artist Tech N9ne on a nationwide tour, which also featured Brooklyn rapper Ill Bill. In the 2008 presidential campaign, Paul Wall spoke out in favor of candidate Barack Obama. He was quoted in The Source magazine as saying "Barack seems to come off as a true leader for everyone, whereas most people campaigning, including Hillary Clinton, seem to be just politicians. Barack seems to be genuine and sincere about his beliefs. He is selfless, while they are selfish. I'm gonna 'Barack the vote' this year and I've never voted before." Paul Wall appears as fictional rapper Grillionaire in the movie I Hope They Serve Beer In Hell, released on September 25, 2009. He, along with screenwriters Nils Parker and Tucker Max, co-wrote tracks for the movie. In 2010, Paul Wall featured on the album Przyjaźń, Duma, Godność, (English: Friendship, Pride, Dignity) by Polish rap artist Kaczor. In February 2011, Paul appeared on an episode of CSI: Crime Scene Investigation along with rapper Yelawolf and singer Christina Milian. In October 2011, Paul Wall collaborated with Silicon Valley-based social and mobile game company Jump Shot Media to create the world's first mobile battle rap game, Battle Rap Stars. Paul is featured as the "main event" and is the rapper to beat in order to win the game. On March 7, 2012 Paul Wall released a mixtape entitled "No Sleep Til Houston". Paul Wall released a collaboration mixtape with Slim Thug for the 2013 NBA All-Star Game in Houston. On December 10, 2013, Paul Wall released his seventh studio album, an 11-track offering, titled CheckSeason, which featured contributions from Stunna Bam, Killa Kyleon, Slim Thug, Lil Keke, Kid Ink and Young Dolph. The record was released independently via his Paul Wall Music imprint. Paul Wall followed up "Check Season" on December 2, 2014 with the release of his eighth studio album, titled The Po-Up Poet which was producedJune "The Jenius" James. According to a Vibe Magazine article in November 2014, "The almost circus-like production reestablishes the idea that as long as Wall's been in the game, he's been a beloved Texas rap legend". During his break from rapping, Paul Wall appeared in Furnace with Ja Rule. He also appeared in the 2009 movie I Hope They Serve Beer in Hell along with Jesse Bradford and Matt Czuchry. He was also in the 2010 Science Fiction movie Xtinction: Predator X. In 2014 he starred in Isaac Yowman's independently released theatrical film "The Holy Spoof" which sold out in all of its theater showings before its digital stream release online. Paul Wall is married and has two children. In 2010, he went on an extreme diet and had gastric sleeve surgery, resulting in an over 100 lb. weight loss. 2005: SSX On Tour for Xbox and PlayStation 2 - "Sittin' Sideways"
2007: Def Jam Icon for Xbox 360 and PlayStation 3 - '"Sittin' Sideways" and "Trill"
1 2 "Texas Births 1926–1995". "Family Tree Legends". ↑ "Paul Wall Biography". Atlantic Records. Retrieved 2008-03-11. ↑ Dansby, Andrew (May 8, 2009). "Rapper Paul Wall is all smiles". Houston Chronicle. Retrieved December 13, 2010. ↑ "Paul Wall...the people's champ". AskMen.com. Retrieved December 13, 2010. ↑ "Paul Wall World – Interview". Paulwallworld.com. Retrieved 2014-02-11. ↑ "Paul Wall | New Music Release | Rapindustry.Com Promotion". Rapindustry.com. Retrieved 2014-02-11. ↑ Rodriguez, Jayson (2007-02-16). "Travis Barker Gets Down With Paul Wall, Juelz Santana While Arm Heals". MTV News. Retrieved 2008-03-11. ↑ Watson, Margeaux (2007-07-06). "Collie Budz". Entertainment Weekly. Retrieved 2008-03-11. ↑ "Hot Pics! Paul Wall, Yelawolf, Christina Milian, Laurence Fishburne and More on CSI!". UrbLife.com. February 13, 2011. ↑ "Paul Wall Featured in Mobile Battle Rap Game". allhiphop.com. October 31, 2011. ↑ "Paul Wall - No Sleep Til Houston Hosted by DJ Drama // Free Mixtape @". Datpiff.com. 2012-03-26. Retrieved 2012-03-31. ↑ Title Artist. "Slim Thug "Welcome 2 Texas Vol. 3"". Hotnewhiphop.com. Retrieved 2013-12-10. ↑ "Stream Paul Wall's "#CheckSeason" LP In Its Entirety". Hotnewhiphop.com. 2013-12-10. Retrieved 2014-02-11. ↑ "Paul Wall Kindly Asks For 'No Favors'". Vibe. ↑ Rose Lilah (2 December 2014). "Paul Wall Releases Stream For New Album "The Po-Up Poet"". HotNewHipHop. ↑ "Hot Trailer: Paul Wall in The Holy Spoof=December 1, 2016". BET. ↑ Black Celebrity Kids,babies, and their Parents » RAPPER PAUL WALL TALKS ABOUT BEING A DADDY. Blackcelebkids.Com (2006-04-18). Retrieved on 2011-01-05. ↑ "Paul Wall Gives Happy Home Tips! Top 7 Family Keepers!". UrbLife.com. 2010-06-20. Retrieved 2014-02-11. ↑ "Paul Wall's Dramatic Weight Loss! Life Changing Surgery; How He Did It!". UrbLife.com. July 13, 2010. ↑ "Paul Wall and Wife Crystal Go Gangsta! Hot Pics!". UrbLife.com. February 13, 2011. ↑ "iTunes - Music - Chick Magnet by Paul Wall". iTunes. Retrieved 2016-10-30. ↑ "iTunes - Music - Po Up Poet by Paul Wall". iTunes. Retrieved 2016-10-30. ↑ "iTunes - Music - slab god by Paul Wall". iTunes. Retrieved 2016-10-30. ↑ "iTunes - Music - Houstan Oiler by Paul Wall". iTunes. Retrieved 2016-10-30. ↑ "iTunes - Music - The Legalizers: Legalize or Die, Vol. 1 by Paul Wall & Baby Bash". iTunes. Retrieved 2016-10-30. 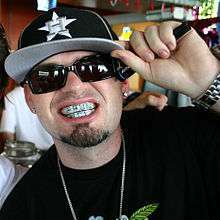 Wikimedia Commons has media related to Paul Wall.